Welding is a hazardous occupation. Due to the nature of the job using high heat welding torches to melt metal together into welded seams and joints, burns are the most common injury for a welder. Spatter (hot metal) and sparks from the weld can cause second- and third-degree burns and ignite materials, including clothing. An arc welder is capable of producing temperatures in excess of 10,000 degrees F.
In fact, work-related burns account for 20-25% of all serious burns requiring hospitalization. Among the dangers in welding are impact, penetration, heat, dust, smoke and fumes, as well as light radiation. Extreme temperatures and ultraviolet or solar radiation can cause skin damage with prolonged exposure. “Welder’s Flash” occurs because of intense ultraviolet light, produced from the arc ray. Skin exposed during welding can develop sunburns from this radiation. The Occupational Safety and Health Administration (OSHA) has a “three lines of defense” outline to help eliminate and remove hazards, and personal protective equipment is the third part of this strategy. Welding aprons fit this definition, and help reduce potential injury in some applications. Of course, making sure there are no openings or gaps in protective equipment is important, so that the entire body is protected. Wool is a better material since it is less flammable than cotton, and won’t be burned or damaged by weld spatter. It also helps to protect the welder from changes in temperature. By Gregory Sanders: This article has been updated to reflect the most accurate information regarding welding aprons and bibs available for those who are interested in welding clothing. The best 5 available have changed, and information has been added to assist individuals in finding the best welding clothing currently available on the market. The FAQ has also been updated. Measures 24” wide by 36” long and is one size fits most. An adjustable elastic waist strap. Neck straps do not always stay in place and may need occasional readjusting. Apron only comes in one size. Stitched with Kevlar thread and reinforced at major stress points so it is durable. Adjustable nylon straps with quick release buckle for easy on and off. What Protection Should a Welding Apron Offer? The intense heat of welding and sparks can cause serious burns for a welder. Ultraviolet light from an arc can cause “welder’s flash” and also skin burns. The upper body, arms, hands, and faces of the welder all need to be protected from high temperatures and debris. To this end, basic welding protective gear (regardless of the type of welding) consists of heavy leather gloves, protective long-sleeve jackets, and heavy leather welding aprons. Protection should be adequate for the task at hand, and protect against risk of burns and radiation. ANSI Z49.1.88-Welding and Cutting (4.3) recommends that the whole body be covered to protect from ultraviolet and infrared flash burn. The particular choice of protective equipment - whether a welding apron or another alternative - will depend on the job being undertaken as well as personal preference. There are some counterintuitive recommendations. Usually lightweight and light-colored clothing is best in hot environments. However, dark clothing may work better for welding since it will produce less reflection onto your face shield. Wool, heavy cotton or leather also don’t wear out as fast. Any part of clothing where hot sparks or particles may get stuck, like pockets or pants cuffs, are also not recommended. Welding bibs, or aprons, are made from flame/resistant materials such as leather. They protect the front of the body when you are looking for that additional layer of protection. Some welders prefer aprons that wrap, tie, or clip at the waist, protecting from waist to knees. A full welding apron, which looks like a chef's apron, provides additional coverage and protection. A full welding apron secures over the shoulders or behind the neck, as well as wrapping around at the waist. Most welding aprons are made of leather and are sewn together with Kevlar thread, which provides a lightweight and strong flame resistant attachment. Some welding aprons come with a handy utility pocket. It is really important to ensure that you protect the whole body when welding to avoid burns and other harmful scrapes due to the potentially dangerous nature of the craft. Choose clothing that is oil-free and made of wool or heavy cotton as they are harder to ignite and resist wear and damage. Wear long sleeved shirts and button the cuffs, pockets and collar. When working with welding torches and hot metal, any uncovered area of skin is subjected to heat and flame. That’s why it’s so important to have a good, protective welding apron or welding bib. 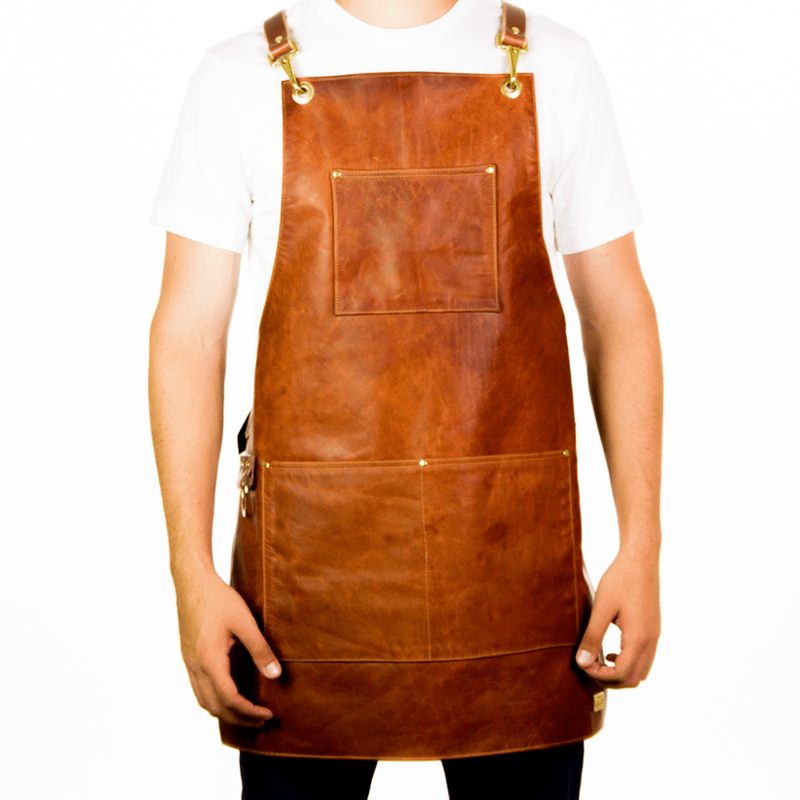 A leather welding apron will protect better than most materials. Not only will it protect the front of your body from sparks and burning projectiles, but is usually extends down to protect your upper legs as well.